It's beautiful out at sea. The water was calm and blue. The sky holds soft white clouds. This is where they made that opening shot for Gilligans Island. 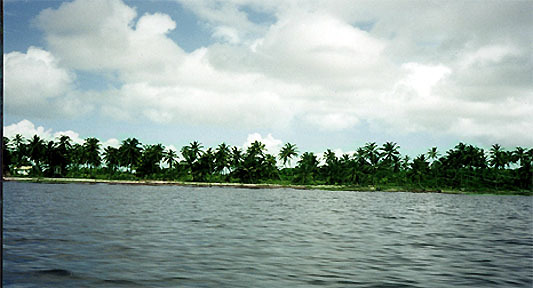 Sandy beaches lead up to low, palm tree covered, coral atolls with no high points. Balmy breezes do blow. I couldn't believe the huge hermit crabs scuttling all over the place. I walked along the shore to the bird sanctuary, but going inland, the big bugs I encountered sent me scuttling back to the beach. They apparently don't bite, but they do land on you and are annoying. It seemed that there were always thunder storms in some direction. Sure enough, from up on deck, I confirmed that at any given time, if you look around 360 degrees, you will see lightning flashing in at least two places on the horizon and usually three. Looking around like that brings the scale of the ocean to you. It's vast and and wonderfully beautiful. 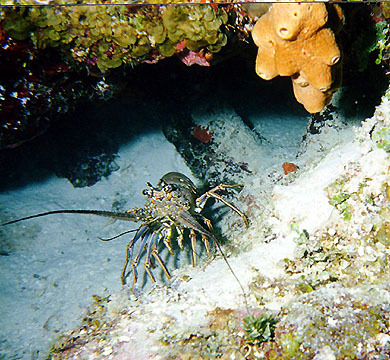 There were so many type of life on the reefs. 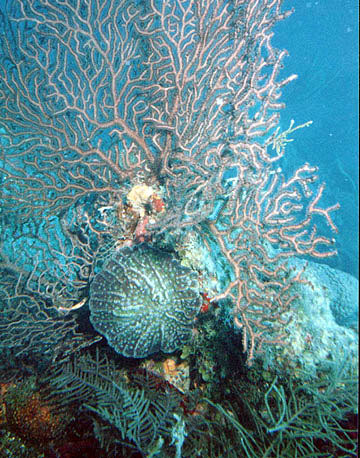 Some of the various types of sea fans grow over 6 feet high. Most everything is some pastel color, but this lower, spreading coral was a beautiful vivid green that the photo just cannot do justice to. Yes, I've kept this web site anonymous, but this fine picture of me that Karen took, just seemed appropriate... This was on the reef just outside where the Blue Hole is. The Blue Hole is a huge collapsed cavern. It was an interesting dive, I guess, but there is little life in there really. 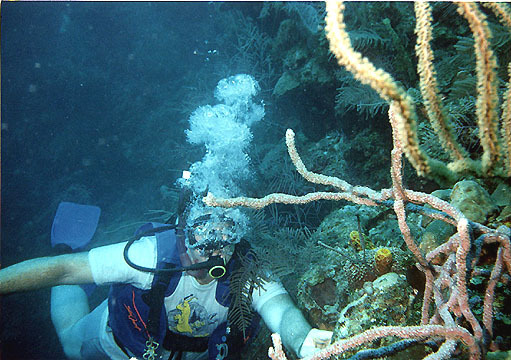 Since it is within the reef, the water is not really suitable for the life of the coral reef. there were some fish, but mostly just green algaes. At about 130 feet was a stalactite hanging down more than 22 feet. That's pretty big for anywhere. Not only did I dive the Blue Hole, but while waiting for people from another boat to arrive, I hopped in and got a well needed shave. Lots of people have dove in it, but how many have shaved in it??? Here's a fairly nice, if poorly framed picture of a pink sponge and a mid sized red sponge. 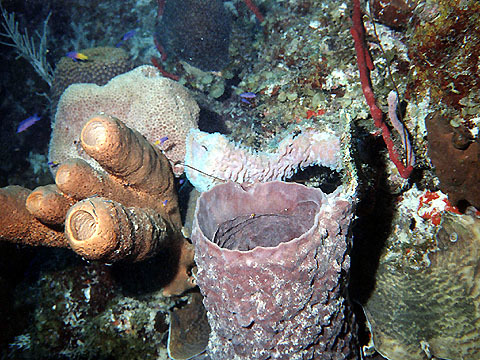 Also notice the small, long red sponge at the upper right. These are fairly common and a very vivid red. There are a number of colorful purple and yellow wrasse' there too. This guy doesn't know the danger that he is in... or maybe he does. It seems to me that critters always have a keen sense of where they are protected or out of season.